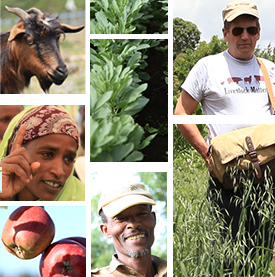 Last week, 80 people from Tanzania, Zambia and Malawi met in Dar es Salaam to design a new ‘Feed the Future‘ project (supported by the United States Agency for International Development – USAID) on sustainable intensification of crop and livestock farming systems. The meeting was convened by the International Institute of Tropical Agriculture (IITA). This was the third in a series of workshops designing multi-year projects in West Africa, the Ethiopian Highlands, and East and Southern Africa. Full information on the workshop and its outcomes is online. The workshop was opened by Professor Jumanne Maghembe, Tanzania Minister for Agriculture, Food Security and Cooperatives, Dr. Sanginga (IITA Director General), and Dr. Julie Howard from USAID Washington. All emphasized the importance of close collaboration between CGIAR staff, their national counterparts, and other organizations and donors involved in agriculture in the region. They welcomed this effort to involve a wide range of people in designing and setting priorities for the project. As in the other workshops Robert Bertram (USAID) introduced the Feed the Future research strategy with its goals to accelerate inclusive agricultural sector growth, reduce child under-nutrition, and integrate climate change and environment concerns in agricultural research. His colleague Jerry Glover explained the evolution of thinking across the projects, referring back to previous workshops in Tamale and Addis Ababa. He particularly highlighted the advantages of designing the three projects within an overall research ‘design’ framework that would foster learning and linkages across the regions. Participants critiqued and improved the two proposed areas of work with their focus on maize-legume-livestock and rice-vegetable farming systems. Arising from these presentations, participants explored ways to operationalize a ‘systems’ approach, how to integrate different technical components, and they identified potential ‘jumpstart’ actions that would build on the many existing initiatives and lay the groundwork for future research. Parallel groups examined possible impact targets for the three-project Program and ways to quickly develop the overall research approach/framework which will inform regional and country project activities. An important side discussion in this workshop considered cross-project Africa-wide activities that would add value to the individual project activities. It was generally agreed that a light coordination and learning structure was needed to ensure consistency and learning across the projects, with coordinated communication reinforcing coordinated research efforts. Finally, there seemed to be acceptance of an overall Program name ‘Africa Research in Sustainable Intensification for the Next Generation’ (Africa RISING); this was first suggested in the Tamale workshop and overcame all other suggestions. 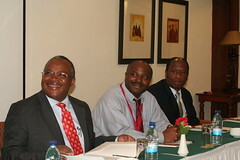 Tags: IITA, USAID. Bookmark the permalink.